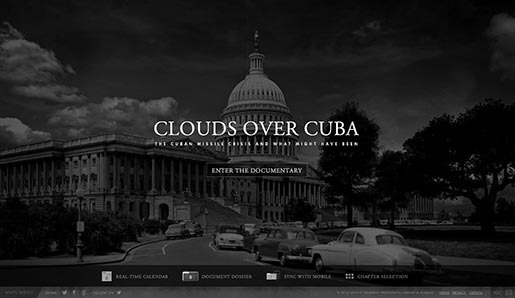 With current crisis over nuclear missiles looming in North Korea, it’s a good time to visit Clouds Over Cuba, CloudsOverCuba.com, a website developed for JFK Presidential Library in Boston. The site was launched on October 16, 2012, exactly 50 years after Soviet missiles were discovered in Cuba, sparking a diplomatic showdown. Site users are invited to explore an immersive documentary laying out the full story of the Crisis, beginning in 1959 and continuing on until the missiles were removed in October 1962. The site also includes one possible vision of how the world might be different today had the Missile Crisis had escalated into nuclear war. The site explores the legacies of Khrushchev, Castro and Kennedy, and the humanizing things we can take away from the Crisis. 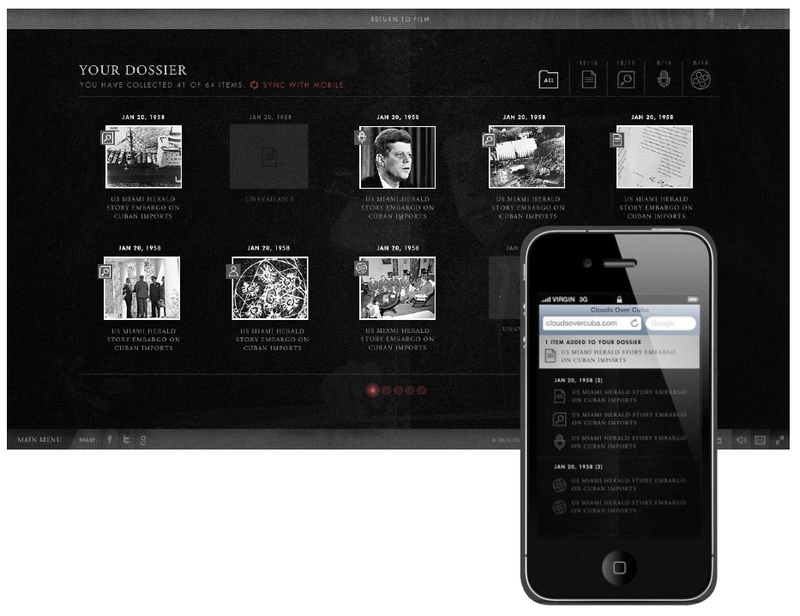 As the documentary unfolds, dozens of archival photos, videos, documents and audio recordings are automatically added to a digital dossier of the website visitor for further review at any time. Smartphone users can also link their devices with the film so their mobile dossiers sync with the documentary playback. 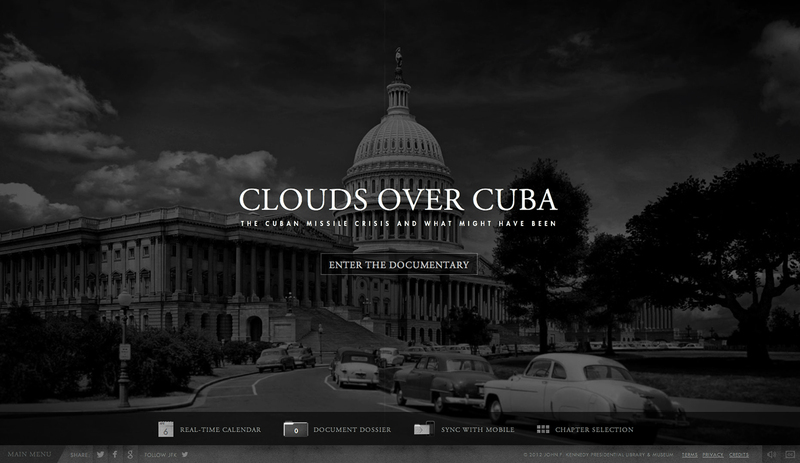 Using seamless HTML5 and innovative UX design, Clouds Over Cuba exhibits an unprecedented integration of desktop and mobile platforms for the documentary film format. But what if history had unfolded differently? Before the film concludes, users can optionally access a short film that takes place in an alternate 2012 in which the Cuban Missile Crisis did escalate into nuclear war 50 years earlier. The film tells the story of four fictional characters who each remember the horrors of nuclear war in their own way. Users can import all the secret ExComm meetings with JFK and his advisors, letters between JFK and Khrushchev and other material from the two weeks into their iCal and Google calendars with one click, so they can “attend” the meetings and receive the communication live over thirteen days, exactly 50 years after they happened. The Clouds Over Cuba project was developed at The Martin Agency, Richmond, by creative team Brian Williams, Wade Alger, Joe Alexander, Ben Tricklebank, and agency producers Nicole Hollis-Vitale and Kristen Little. Live action and digital production was produced at Tool of North America by directors Erich Joiner and Ben Tricklebank, director of photography Robert Richardson, digital producers Kristen Koeller and Brandon Sanders, executive producers Steve Humble, Joe Alexander, Erich Joiner, Brian Latt, Dustin Callif and Oliver Fuselier. VFX were produced by Justin Young. Editing was done at Stitch Editing by supervising editor Dan Swietlik, editors Chris Catanach, Adam Wood, Alex Tedesco and Tracy Hof. Post producer was Chris Girard. Sound was mixed at Margarita Mix by mixer Jeff Levy, assistant engineers Mike Murzyn and Sean Melia, executive producer Michelle Millard and senior producer Whitney Warren. Music and sound design were produced at Plan8, Stockholm.